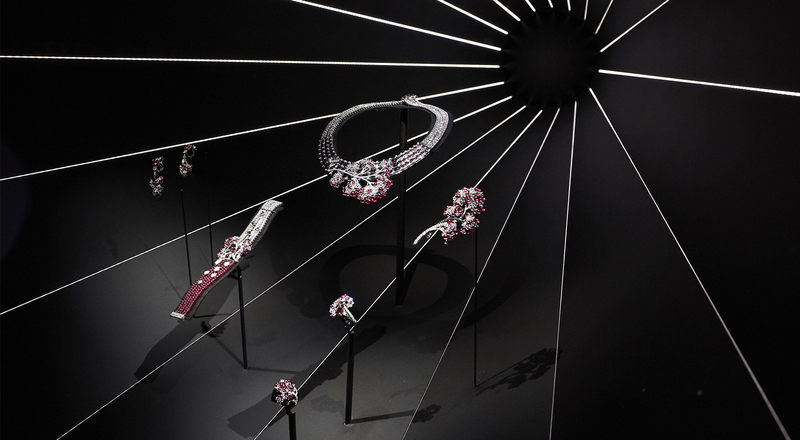 The Mitsubishi Ichigokan Museum in Tokyo welcomes The Worlds of Chaumet, an exhibition that takes visitors on a journey through the history, culture and savoir-faire of the renowned Paris fine jewelery Maison. The exhibition pays special tribute to the host country, showcasing the strong ties between Chaumet and Japan, along with their shared influences and inspirations. The Worlds of Chaumet proposes a compelling dialogue between jewelry and artistic movements, between contemporary and historic pieces, and between jewelry creations and objets d’art. This dialogue illustrates a key moment in the history of Chaumet, when the Maison engaged with the world beginning in the second half of the 19th century, welcoming diverse influences while radiating its unique Parisian style to become a major figure in the history of fine jewelry. “For more than two centuries since its founding, Chaumet has shown a curiosity for everything, for all the ‘elsewheres’ in the world, whether historic or exotic. This curiosity has included a special interest in Japan, a country that continues to inspire contemporary creation,” says Henri Loyrette, honorary president of the Musée du Louvre, who curated the exhibition alongside Akiya Takahashi, director of the Mitsubishi Ichigokan Museum. Thanks to loans from the collections of prestigious museums and institutions, the exhibition presents some 300 pieces, spanning precious jewels, paintings, drawings and a host of previously unseen archive items. The works are elevated by the innovative scenography designed by Bureau Betak, creating delightful surprise effects. The high point of the exhibition is a section on the artistic encounter between Chaumet and Japan, illustrating the influence of the Japonism movement on Chaumet’s creations from the second half of the 19th century. This influence is spotlighted in High Jewelry pieces created specially for the event, expressing an ode to the delicacy of nature and symbolizing the culture of excellence that Chaumet shares with Japan.